Cardigan Welsh Corgi Dogs - The Cardigan Welsh Corgi is one of two separate dog breeds known as Welsh Corgis that originated in Wales. It is one of the oldest herding breeds. The Cardigan is a long, low dog with upright ears and a fox-like appearance. The old American Kennel Club standard called it an "Alsatian on short legs". 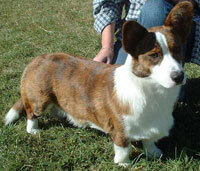 Unlike Pembroke Corgis, who are bred to have only a small nub of a tail (without docking) the Cardigan's tail is long. Cardigans can be any shade of red, sable, or brindle; they can also be black with or without tan brindle or blue merle (black and gray or marbled) with or without tan or brindle. They usually have white on the neck, chest, legs, muzzle, underneath, tip of the tail, and as a blaze on the head. Other markings include ticking on the legs and muzzle, smutty muzzles, monk's hoods, and others. A few other unofficial colors can occur, such as red merle. An average Cardigan is around 10.5 to 12.5 inches (260 to 315 mm) tall at the withers and weighs from 30 to 38 lb. (13.6 to 17.2 kg) for the male and 25 to 34 lb. (11.3 to 15.4 kg) for the female. Originally bred for herding sheep and cattle, they have proven themselves as excellent companion animals and are outstanding competitors in sheepdog trials and dog agility. Cardigan Welsh Corgis were bred long and low to make sure that any kicks by cattle would travel safely over the dogs without touching them. Like most herding breeds, Cardigans are highly intelligent, active, athletic dogs. Affectionately known as "a big dog in a small package," Cardigans are affectionate, devoted companions that can also be alert and responsible guardians. 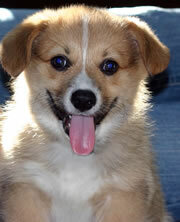 Cardigan Corgis are typically a 'one-man dog'. They are quite wary of strangers and prefer to reserve their affection for a select few with whom they are familiar. This information is licensed under the GNU Free Documentation License. It uses material from the Cardigan Welsh Corgi article on Wikipedia.org. Cardigan Welsh Corgi Breeders - Advertise your kennel puppies and dogs here. Dansar Hill Cardigan Welsh Corgis - Tennessee - Raising quality champion pedigreed Cardigan Welsh Corgis for pet or show homes!